Is a Practice Transition Right for You??? Many dentists ask themselves this question. It’s often difficult to answer, given the profusion of misunderstanding and misinformation surrounding dental practice transitions. If you’re contemplating a practice transition, or are interested in learning about the various benefits available through a successful practice transition, it’s critical that you fully understand all the possibilities and potential pitfalls involved. A practice transition is the comprehensive and systematic process of incorporating another provider into your practice with the mutual intent being to eventually either share or transfer ownership of the business at an agreed-upon point in the future. A transition may be executed for practice growth or as an exit strategy. Often, it’s an evolutionary combination of both scenarios. Each transition process is entirely unique. As such, it’s imperative that the process begin with and be framed by the unique vision of both the owner and associate dentist. If you are an owner-dentist, it’s of particular importance that you understand how the transition will fi t into your overall life plan. Within the context of your specific vision, you must consider and evaluate how a practice transition can support your goals over both the short- and long-term; complement your five- and 10-year business plans; enhance your philosophy toward dentistry; strengthen your ability to maintain the ideal schedule and perform more of the dentistry you prefer; and reinforce your vision of the ideal exit or growth strategy. A properly executed transition can enable your practice to reach its full financial and production potential, beyond your individual contribution. It can increase your time outside the practice without decreasing your cash flow, or increase your cash flow without increasing your scheduled time in the practice. It can support your desire to perform the dentistry you love, allow for professional collaboration and added freedom within your practice, and provide continuity for staff and patients. With a properly executed transition you can create the opportunity to continue to practice dentistry post-sale without the full commitment of ownership. Importantly, a successful transition can also generate significantly greater overall financial return for you, as compared to proceeds from a brokerage scenario. Is a transition a viable option for you? Remember that possibilities drive transitions. It’s advisable to look beyond the surface of your practice to discover the wealth contained within, which can be augmented and shared with the right associate. You should work to identify the hidden potential that can be exposed and amplified in order to create new opportunities for incremental value and growth. First, you need to determine your overall level of transition readiness. Three fundamental areas of readiness must be examined, measured, analyzed and aligned in order to ensure a successful transition. They are: financial readiness, mind readiness, - practice readiness. Let’s take a look at each of these in the space below. An equity-structured transition can offer significant benefit to the associate dentist. The affordability proposition available to the new dentist from a carefully engineered and well-orchestrated equity transition is invaluable. Reality: Most new dentists enter the profession weighted down by six-figure education-related debt, in addition to a mortgage, living expenses and growing family responsibilities. Their debt-to-earnings reality makes it nearly impossible to secure the type of loan required to purchase a practice immediately and outright. The debt related to carrying multiple loans is insupportable given new dentists’ initial earning potential as they attempt to master clinical, business, and patient relationships. Opportunity: Remember that transitions are driven and powered by possibility. The equity-structured transition affords a new dentist the ability to buy into a practice using time and equity over time — creating incredible potential and possibility for practice growth and success for associate and owner-dentist alike. a seamless transition developed organically over time as relationships develop and evolve. A healthy trial period is imperative to the success of the transition. The trial period affords you the time to “try before you buy” and gives you a chance to truly ascertain that the personalities, philosophies, dentistry styles, management styles, location and even expandability potential is a good fi t for you and your life vision. The goodwill value at the time immediately preceding the equity period — established, recorded and static going forward — so it is fair for both parties. The goodwill value accounts for factors such as patient base, practice reputation, and collections, among other things. By establishing the purchase price at the beginning of the equity period you won’t pay for any increase in the goodwill value as a result of your continued growth in productivity and personal marketing efforts. This is not only fair, but it also fosters an environment for you to continue to grow and learn. Hard assets — evaluated and documented but subject to change over the equity period based upon capital and technological investments made by the owner-dentist during the equity period. The equity period typically lasts three to four years, during which time your hard work (“sweat equity”) will count toward ownership. You are incented for working toward building growth, as the practice’s intrinsic value has been permanently established. Again, both parties benefit from the growth achieved during the equity period. The equity period also takes the pressure off you to “make ends meet” while you’re still learning the skills needed to become a high-quality and productive practitioner. The emphasis during the equity period remains on education and clinical skills. The ability to buy into the practice, which is now worth more, at the pre-established valuation price. The loan you ultimately take out to finance the buy-in portion above the equity/escrow amount you have saved is a smaller portion of your take-home pay because of the value you’ve added to your production and the practice. The use of an experienced adviser can help to eliminate surprises, create alignment and maximize the opportunity for practice, personal and transition success. The key when selecting an advisory firm is to find one focused on the best outcome for the practice as a complete entity, inclusive of both current and future owner-dentist. your desire or need to work in the practice after the sale. For the growth transition, personal economics play an equally important role in determining financial readiness. Factors for consideration include your ability to sustain a possible reduction in income temporarily as the associate is transitioned into the practice, and the impact of personal and/or practice debt on your options for a growth transition. Even the financial health of the associate/ future owner needs to be assessed to ensure his or her ability to meet his or her own obligations. Mind readiness. A realistic assessment of your mind readiness requires a willingness to embark upon meaningful and honest introspection. As the owner-dentist, you must be prepared mentally for the inevitable disturbance that can occur when adding another dentist and ultimately sharing or giving up business control and decision-making. Your past successes as a solo practitioner may not guarantee the future success of a joint partnership. Be aware of the fact that as the transition process unfolds, your management style must shift from personality-driven to also include business- and system-driven initiatives and philosophies. A transition often necessitates a paradigm shift. This evolutionary process is easy for some — difficult for others. Associate integration requires an owner-doctor and the entire team to embrace change, to welcome a “new normal.” The transformation won’t take place overnight, as changes to responsibilities, schedules, mindsets and behaviors will require time for adjustment, acceptance and movement through some inevitable growing pains. Ensuring your team’s mind readiness is also paramount to the success of your practice transition. Proactive communication and dialogue regarding your vision and transition plan can help employees to understand and buy into the impending evolution of your practice and its team dynamics. Practice readiness. Practice readiness is a measurement of your practice’s current metrics (production in all arenas, patient base and flow, facility size, technology and equipment) that provides insight into its ability to sustain the addition of another dentist. There are three foundational practice components that will form the basis for your practice readiness formula: your patient base, your facility, and your team. For example, does your practice have ample space, patient flow and team census to support the associate dentist? Furthermore, can your current internal practice systems, equipment inventory and team expertise levels optimally sustain the growth and change that inevitably accompany an associate integration? The figures that comprise the responses to these questions will create the framework for your transition action plan. Determining a practice’s overall level of readiness is not always an intuitively straightforward process. While rooted in the hard numbers of financial and performance metrics, practice readiness also considers any unique practice nuances that factor into the overall transition plan. These nuances could be related to a discussion of “want” vs. “need” regarding an expansion or move for the practice, an investment in new technology and/or equipment, the composition of major restorative, basic restorative and hygiene production distribution, and the current and future production goals of the owner-dentist. Additionally, enhancements to practice management systems, staff management/retention, debt management, and practice profitability within the context of your overall transition vision should be factored into the equation. Your overall transition readiness is determined by the discoveries made within each level of readiness discussed above. It’s critical for all levels of readiness to be firmly aligned. While your personal finances and practice may be ready, if your mind hasn’t reached alignment, then the transition won’t be successful. 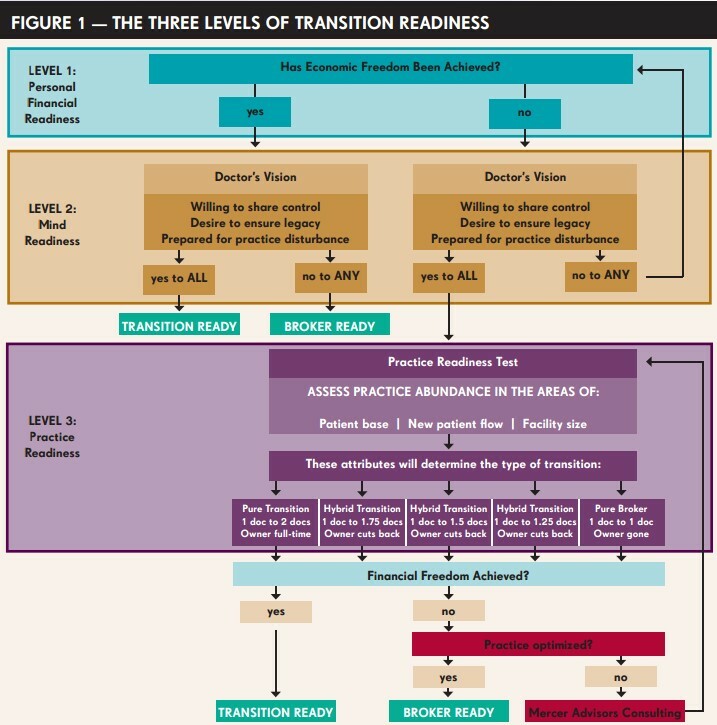 There are multiple dimensions that factor into your overall readiness, including your understanding, acceptance and resolution of any readiness gaps prior to proceeding forward toward a successful practice transition. Remember, you must plan your work and then work your plan. Proper planning for a transition requires and takes time. Most dentists will work together for six months to one year before conducting their final planning. The planning process itself (valuation, cash flow modeling, tax planning and document creation) can take another three to six months. It is imperative that you allow yourself the time and freedom to plan effectively. Conducting a transition will likely be one of the most important decisions you make, both emotionally and financially. Different professional advisors will proffer a different perspective for your transition, based upon his or her area of expertise. For example, a CPA will focus primarily on the financial and tax implications of the deal. An attorney will focus on formal documentation of the deal that protects your best interests. A broker will focus largely on closing and implementing the deal. Each of these viewpoints serves an essential purpose in any contractual arrangement. But optimal transition success is achieved through the integration of these various ancillary elements into a single source of consistent, multi-disciplinary advice that supports your practice and unique vision. Assessment and planning. Vision casting, readiness assessment, financial planning, gap analyses, optimization strategies, team communication, plan creation, associate identification — this stage comprises all of the preparation tasks necessary to set your transition plan in motion. Trial period. While intent of future ownership will exist from the beginning, each transition starts as a straightforward employer-employee relationship. It is vitally important that you have ample time to work together without ownership obligation to ensure that the fit is right. The details and evolution of your mutually agreeable working relationship should be clearly outlined in your transition plan. Practice valuation. If the owner-dentist and associate are committed to moving forward, a practice valuation is conducted and all terms of the transition agreement finalized at this point. The practice sale price, the pricing/payment/salary structure, and the timing of the business deal should be included. 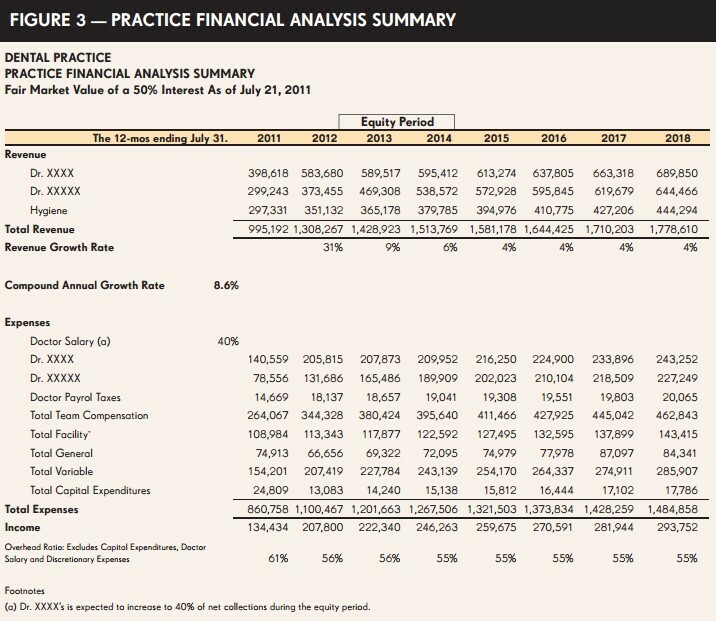 Remember, the valuation must represent a benefit for each involved party, and needs to fi t within practice projections. The valuation will be driven by the expected cash flow to each owner in the future. Customized tax planning for both owner and associate is a vital component of a successful practice transition. Closing period. At this point, the practice value has been established, agreements are in place, and the collective focus is on practice growth. The associate is now building equity at an increased compensation rate in order to ensure growth of his or her equity account for an eventual buy-in or buy-out scenario. If the transition is structured as a buy-in, the owner and associate must collaborate to establish their collective philosophy regarding partnership, decision-making, distribution of profits, and practice and team management. If it’s structured as a buyout, the owner and associate must agree upon whether the original owner will continue to work after the sale, and if so, under what terms. This option, called the Grand Doctor phase, is often viewed as a key transition benefit by and for both parties. Many dentists do not understand the breadth of value potential available within their practice. Beyond acomfortable lifestyle and professional satisfaction, there are three additional areas of value that can be amplified through a practice transition. Transition value. This represents the increase in practice value that is achieved as the result of a long-term transition for growth strategy. 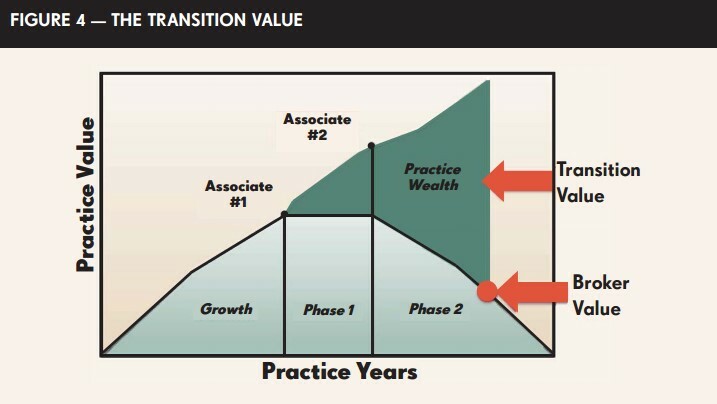 For example, as illustrated in Figure 4, a practice transition sale can be designed to occur in stages, over time, netting far greater value and return for both dentists than would be otherwise achievable through a single brokered sale transaction. Enterprise value. This represents the increased income potential available to the practice owner(s), both present and future. The enterprise value is often quite significant, and incrementally so for a longer-term transition. Legacy value. This represents the owner-dentist’s ability to create the ideal practice environment within which to work upon exiting ownership. The Grand Dentist is able to continue practicing and earning a part-time income, while the new owner-dentist benefits from the continued professional relationship and increased practice production. Legacy value enables the original owner to exit dentistry on his or her terms, while ensuring the practice will continue to meet the needs of its new owner, staff and patients. Ultimately, the key to a successful and satisfying transition involves proactive and comprehensive planning, coupled with systematic execution and open communication on all fronts. This entails the ability to increase the value of the practice, documented acknowledgement of each party’s contributions, and a genuine focus on the long-term success of the practice and the owner dentists — past, present and future. Why does a transition fail? The most common reason for failure is a lack of preparation for and understanding of the complex and multifaceted components involved in a transition. However, with the right mindset, intent, context and advisory expertise, a practice transition, either for growth or for retirement, presents an exciting business opportunity, one limited only by the parameters of your unique vision. Are you ready to create additional opportunities for practice growth throughout your career or an exit strategy for retirement? Our Transition service will guide the way with expert advice, comprehensive planning and the deliverables you will need from start to finish. Contact us today at 800.444.6162 or email us at practicetransitions@pattersondental.com.